Sohma Isuzu, otherwise known as Rin, is the horse of the zodiac. Rin doesn't appear until much later in the series, making her one of the two juunishi that never appear in the anime. She's frail and of poor health but she's absolutely determined to break the zodiac curse. This puts her in Tohru's path, as the two end up having the same goal. She's also Hatsuharu's girlfriend and has suffered greatly at the hands of Akito. Rin and Kyo barely interact at all but we learn that when they were young, they would often stare angrily at each other from across the room when she came to stay at Kazuma's home. They'd stare for five to ten minutes continuously and occasionally, Hatsuharu would come along and just watch. Kyo tells Tohru he used to not like Rin as a child because he felt that she was stealing Kazuma away from him whenever she visited. Rin's curse is broken at the same time as Kyo's and most of the other zodiac members. When Kyo and Tohru come to tell Kazuma that Kyo's curse has been lifted, Rin and Hatsuharu arrive shortly after to say they have also been freed from the curse. After the final banquet, Rin overhears Kyo and Tohru talking to Kazuma about confessing their love for each other. She calls them idiots and cannot believe that even Kyo -- who had gone through just as many horrible things as she has -- could forgive Akito and act like nothing happened. 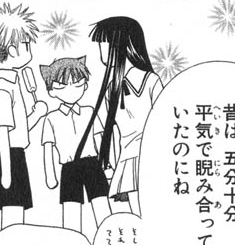 Tohru consoles her as Kyo watches. I think that Rin and Kyo have quite a bit in common… Kyo is the "least liked" but of the zodiac members, Rin gets the worst treatment from Akito. In fact, I think Akito treats her even worse than she treats Kyo. As far as we see, Kyo is never physically beaten by Akito and is not set to be confined to the cat's room until his graduation. Rin, however, is pushed out of a second story window, locked up in the cat's room for a long period of time and has her hair roughly cut away. They both have had the same level of psychological trauma though; both sets of parents treated both children with disdain and both are taunted by Akito for it. I think as a result, they both have the same kind of surly, stand-offish personalities when they first appear in the series and it makes sense that they'd both stare moodily at each other whenever they were in the same room as children.